Click here for downloadable image. 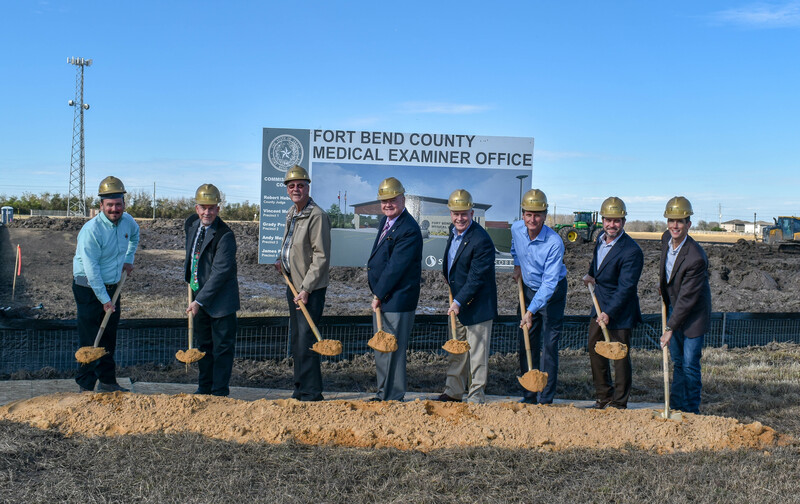 Fort Bend County, TX – On December 17th, 2018, Officials broke ground on the new Fort Bend County Medical Examiner Facility. The State of Texas mandates that counties with a population of 1 million or more must have a Medical Examiner. With a current population of more than 770,000, Fort Bend County is rapidly approaching this requirement. The feasibility study commissioned by Commissioners Court in 2014, proved the cost benefit to bringing the Medical Examiner services to the County now instead of contracting out to the surrounding areas, and promoted the court to begin construction on the facility this month. The facility, located on Klauke road next to the new Fort Bend Transportation Center, will consist of two buildings totaling 11,880 sf with space to expand as the County population increases. Fort Bend County is currently looking for a Medical Examiner to operate the facility upon its completion in August. Pictured Left to Right: Stantec Project Architect, Doug Joder; Justice of the Peace, Pct. 1, Place 1, Gary Janssen; Commissioner Precinct Four, James Patterson; Fort Bend County Judge Bob Hebert; Commissioner Precinct 1 Vincent Morales; Fort Bend County Facilities Director, James Knight; Crain Group President Brad Crain; Crain Group Vice President John Green. FORT BEND COUNTY, TX – On November 27, 2018, Fort Bend County Commissioners Court unanimously passed a resolution in support of a no-kill policy for Animal Services. The Resolution states that Fort Bend Animal Services has maintained a 90% save rate for dogs for the years of 2016, 2017 and 2018. The implementation of the new Trap, Neuter and Return (TNR) program in June of 2018 has allowed for a save rate of 90% for cats as well for the last 4 consecutive months of this year. 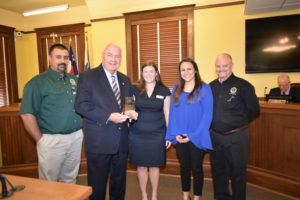 Fort Bend County has been working toward this goal over the last 8 years by providing infrastructure and financial support, including the expansion of the Animal Services facility and the addition of a veterinarian and a vet tech as well as developing partnerships, programs and education to improve adoption rates. Fort Bend County Commissioners Court resolved to continue with the support needed to attain the goal of No-Kill status. Houston, Texas — Fort Bend County Commissioners voted during their regular meeting this afternoon to approve a lawsuit that seeks a declaratory judgement from a Federal District Judge regarding the U.S. Army Corps of Engineers’ (“Corps”) operation of the Barker Reservoir. The County and the Fort Bend County Drainage District believe the Corps does not have the legal authority to inundate property the Corps does not own in its operation of the Barker Reservoir. Together with Fort Bend County Drainage District (together “Fort Bend”), Fort Bend will allege that the Corps knowingly operated the Barker Reservoir, located on the west side of Houston, in a manner that unlawfully flooded land the Corps did not own. The Plaintiffs are seeking to compel the Corps to operate the Barker Reservoir legally and constitutionally, and are not seeking monetary damages. According to the County, the Corps designed and constructed the Barker Reservoir to protect the City of Houston from flood damages by detaining and storing floodwaters in the Addicks & Barker Reservoirs. But, the Corps failed to acquire sufficient land to store the amount of water the Reservoirs were designed to detain. 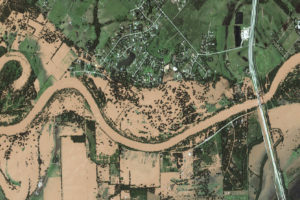 In its complaint, Fort Bend will allege that the Reservoirs’ design and modifications, combined with the Corps’ standard operating procedures laid out in its Water Control Manual, made it inevitable that the limits of the Corps’ property would be exceeded, thereby flooding land for which the Corps had no property rights upstream of the Barker Reservoir, if the Reservoir reached near full capacity. According to the Corps’ own analysis, the Corps knew about the inherent risks of its operating procedures, and knew that the possibility of litigation based on its inaction was high. As a result, the Corps’ unlawful policies caused extensive harm during Hurricane Harvey and continue to jeopardize the property rights, economic interests and welfare of Fort Bend County, the Fort Bend County Drainage District and county residents. The lawsuit seeks a declaration that the inaction of the Corps, especially intentionally using land upstream it did not own to store water, was unlawful. The lawsuit also seeks an injunction that would prevent further impounding of floodwater on land it doesn’t own upstream of the Barker Reservoir. “The County is filing suit seeking to require the Corps to follow federal law and its own rules in its operation of the Reservoir,” said Fort Bend County Judge Bob Hebert. The suit will be filed on behalf of the Plaintiffs by Texas law firm AL Law Group in the United States Southern District of Texas, Houston Division. Fort Bend County is located in Southeast Texas and is adjacent to Harris County. Fort Bend County, founded in 1837, has grown to be the tenth-most populous county in Texas. Fort Bend County owns property which was affected by overflow from the Hurricane Harvey floodwater that the government-owned lands within the Barker Reservoir was unable to detain. The primary mission of the Fort Bend County Drainage District (FBCDD) is to maintain the drainage channels, where the District has easements, in their existing flow conditions. This is accomplished through appropriate structural repairs and vegetation control. The District also reviews plats and drainage plans of new development to be approved by Commissioners Court to assure the elimination of an adverse drainage impact on current and future residents. FBCDD owns real and personal property which was affected by overflow from the Hurricane Harvey floodwater that the government-owned lands within the Reservoirs were unable to detain. AL Law Group, PLLC is a state and nationally recognized litigation and administrative law firm with offices in Houston and Austin, Texas. Since its formation in 2010, Members Keith Lapeze and David Tuckfield have represented clients throughout Texas, the Gulf Coast, and the entire country in regulatory proceedings, business disputes, commercial litigation, and more. FORT BEND COUNTY, TX – On May 1, 2018, Fort Bend County Commissioners Court authorized advertising a ‘Request for Qualifications’ (RFQ) for a countywide watershed study. This study will provide up to date information on water flow across the county, allowing the Court to use it as a tool to plan and prioritize flood mitigation projects. The RFQ is the first step in performing this extremely broad-based study that will evaluate water flow patterns and identify problems over the entire 880 square miles of the county. The study will look at streams, creeks, bayous, drainage districts and levee districts, as well as consider the effects of development that Fort Bend County has experienced in the last 30 years and will experience for decades to come. The study will also integrate current research on the Barker Reservoir, and Jones and Bessie’s Creeks into the final report. “As a result of this study, we are going to determine and prioritize improvements in the handling of water within the entire watershed that will mitigate the risk of flooding, especially during high rain events,” said County Judge Bob Hebert. Governor Abbott has asked for funds from the federal government for this study, but there is no indication at this time as to when or if funds might become available. “We know that if the study were funded directly by the federal government, the process would add a significant amount of time to its completion. Based on our recent history with the river and rainfall in the county, we do not have the time to wait. We will move ahead on this study. Hopefully, federal funding will catch up with us so we are following all federal procurement rules to maintain eligibility,” Judge Hebert said. Fort Bend County is located in the Texas Southeast, immediately South and West of Harris County and the city of Houston. It is the home of more than 750,000 people and is one of the fastest growing counties in the United States. For more information about Fort Bend County, visit the county homepage at http://www.fortbendcountytx.gov.